A delightful three bedroom semi detached property is available with no upper chain, it also retains a number of it's original features. The property benefits from a conservatory and a rebuilt oversized garage to the rear of a generous garden. Wooden single glazed door and window to hall. 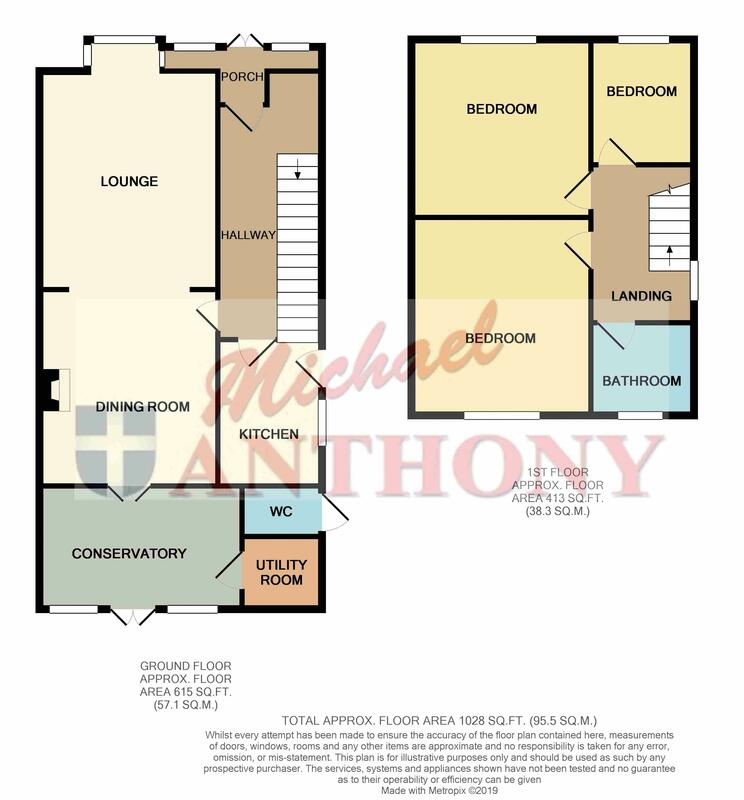 Stairs to first floor, understairs storage cupboard, doors to kitchen and lounge. Wooden single glazed window to rear aspect. High level w.c. Box bay window to front aspect with shutters. Radiator, television point, open to dining area. Wooden door to conservatory, radiator, open fireplace, open to lounge. Double glazed window to side aspect, double glazed door to side. Range of base and eye level units with roll top work surface, stainless steel single drainer sink unit with tiled splash back, integrated dishwasher, space for fridge/freezer. Double glazed windows to rear aspect, double glazed door to garden. Tiled floor, radiator, door to utility area. Space for washing machine and dryer, wall mounted boiler. Double glazed window to side aspect. Access to loft space, doors to bedrooms and family bathroom. Double glazed window to rear aspect. Radiator, wardrobe to remain. Double glazed window to front aspect. Radiator, wardrobe to remain, shutter on window. Double glazed window to front aspect. Shutter on window, radiator. Frosted double glazed window to rear aspect. Low level w.c. pedestal wash hand basin, bath with shower attachment over, tiled walls, heated towel rail. Up and over door, power and light, courtesy door to garden, off road parking for four cars. Gravel off road parking for two cars, patio slab walkways. Laid to lawn with patio and decked and shingled areas, assorted trees, flower bed, brick barbecue, two sheds, double gated access, side access to front.